A fast riser in 2018 who came over in the Manny Machado trade at the trading deadline and may end up jewel of the trade. 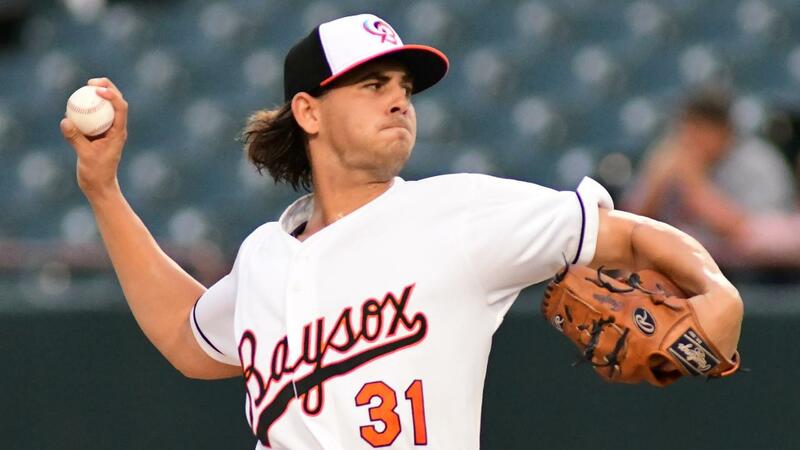 Kremer is 22-year old right-hander who just plain misses bats with his deceptive 91-94 MPH fastball and hard tight curveball (78-80) which he offsets with a slider and emerging changeup. The impressive thing is he misses bats in the strike zone with the pitch so he’s not just getting minor league hitters to chase. He’s a smart pitcher who knows how to read bats, shows no fear, and has tremendous mound presence. He struck out 178 (12.20/9) in 131 IP between High-A and Double-A and held batters to a .225/.296/.337/.633 slash line. Will his changeup become a third weapon for him and can the slider/cutter become a solid average 4th offering. Can he stay healthy? Will his deception play against older more experienced hitters? Kremer is an intriguing guy who looks like a pretty safe bet to be a #3 or #4 starter in the big leagues. With his above average makeup and pitching smarts along with having a chance at two plus pitches and two average ones, Kremer is a guy who we may be underselling due to his lack of pedigree. He’s a guy who could be pitching in Baltimore next year at some point.